Santa is one very busy guy. He usually has a cell phone with him but because he visits in person with so many people (especially in December) your chances of catching him on his cell are pretty slim. He also has a phone in his office, but he is rarely at his desk in December, too. 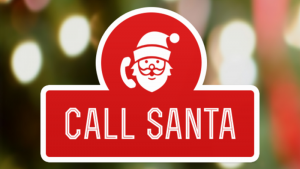 Nevertheless Santa encourages those who want to reach out by phone to do so. Just leave him a message. It can be your wishlist, something you just want Santa to know or even to just wish him a Merry Christmas. He listens to each of the messages he receives! Calling the North Pole, especially in December, is kind of the same way. But we provide our number so you can reach us. Leave us your contact information if it is something really urgent. These are great alternative methods to get hold of Santa and the North Pole. But we also still encourage you to write and send letters the old fashioned way too!